Tsukiji Fish Market, the biggest wholesale fish and seafood market in the world, is full of energy and delicious food. However, it can be overwhelming and possibly dangerous for those with disabilities. The first market in Tokyo was established by Tokugawa Ieyasu (1543 – 1616) during the Edo period to provide food for Edo castle. The food that castle didn’t buy was sold at a market called uogashi near Nihonbashi Bridge. 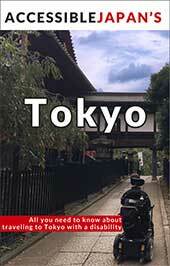 The 1923 Great Kantō earthquake devastated most of Tokyo, including the fish markets. During reconstruction, the market was moved to its present location in Tsukiji and the current building was completed in 1935. Tsukiji Fish Market is said to be the biggest wholesale fish and seafood market in the world and also one of the largest wholesale food markets of any kind. The market is made of an outer and inner section. The inner section is the area where the tuna auctions happen and wholesalers work. It is a hive of activity as workers cut and prepare fish to sell for retailers and merchants buzz around at high speeds on motorized carts. While it draws many tourists, it is a work place and since visitors can get in the way of professionals making their livelihood, it is off limits until 10:00 am. Please note, this wholesale market area is expected to move to Toyosu around winter 2017/2018 at the earliest. 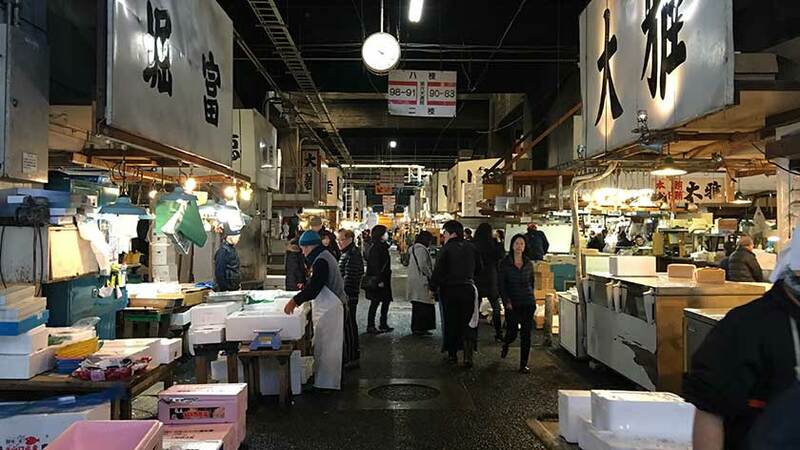 Tourists are encouraged to visit Tsukiji’s outer market, which is located on the outside of the wholesale market and focused on selling to the public. The outer market features numerous merchants selling everything from fish to meat, and all things related. Most offer free samples, and there are a number of stores that have seats out front for 2-5 people to enjoy a meal. The market is open from around 5:00 AM – 2:00 PM. 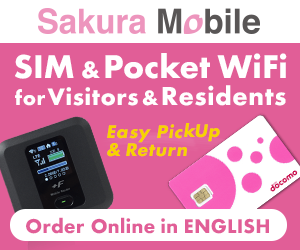 Tsukiji Fish Market can be accessed by Tsukiji Station on the Hibiya Line, or Tsukiji Shijo Station on the Toei Oedo Line. Both stations are wheelchair accessible. Click on the station name to see the station layout. The outer market has no steps and is, in a sense, wheelchair accessible. The biggest challenge to those with disabilities is that the streets are narrow and absolutely packed with shoppers and tourists. It is impossible to enter most, if not all, of the shops. However, most have their wares on tables in front of the store and at wheelchair eye-level, so those braving the crowds can still see most of what is available for sale and try the samples. The restaurants that are basically counters with a few seats are accessible to those in wheelchairs. 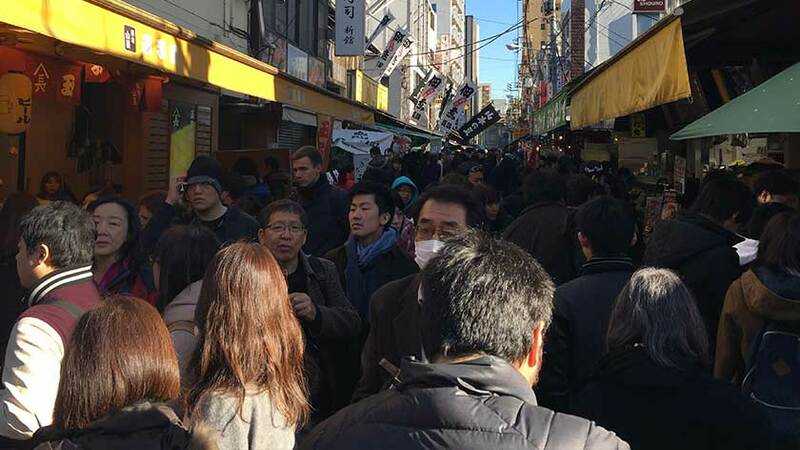 While the main street of Tsukiji’s outer market is packed, the market takes up most of a city block, so there are less crowded streets to explore as well. The inner market may be blocked from entrance. When Accessible Japan visited, one guard refused us entrance as it was “too dangerous”, we entered from a different side where a guard let us pass but just said to be careful. The market floor is very old concrete and littered with ice chips and Styrofoam boxes. 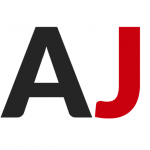 While that in itself is not a problem for most wheelchair users, the area is actually dangerous as workers on tight schedules whiz around on motorized carts the size of fork trucks at very high speeds without much regard to those in the way. An accident with a wheelchair user is a very real possibility. 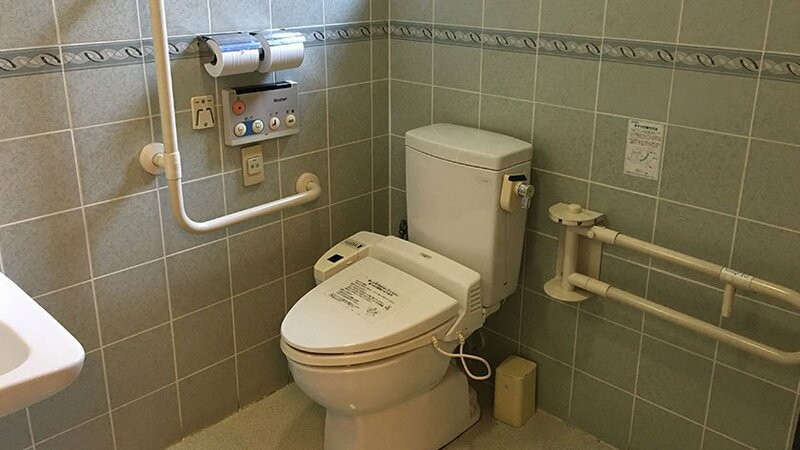 Wheelchair accessible toilets are available at Tsukiji Nippon Fish Port Market as well as the nearby Tsukiji Honganji Temple. 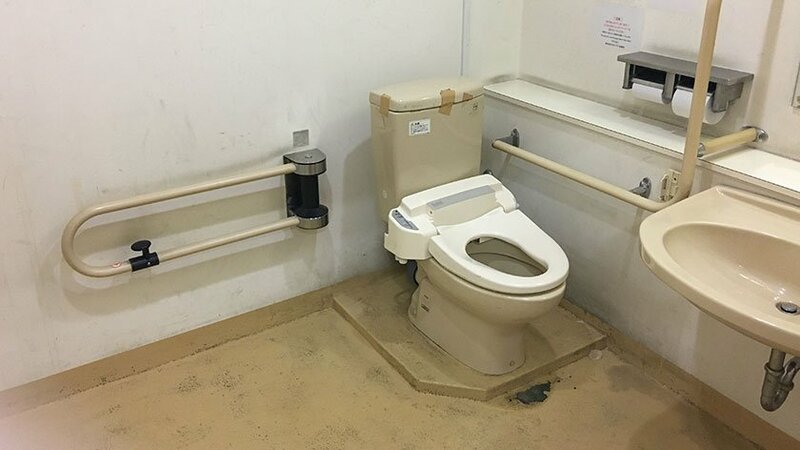 The toilet in the temple is a bit harder to find (enter the temple via the ramp next to the main steps), but is far cleaner. The outer and inner markets provide different obstacles to visitors with disabilities. The inner market is a place of work for wholesalers and staff do not go out of their way for visitors – in fact security guards may actively block those in wheelchairs due the very real danger of getting in an accident with a fast moving motorized carts. The outer market, on the other hand, welcomes visitors and encourages them to buy goods at the stores. Unfortunately this means there are masses of people filling up the already narrow streets. 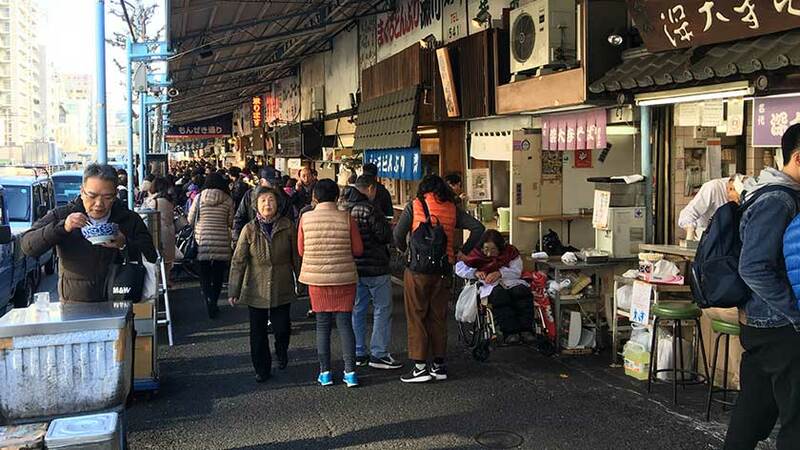 You can still enjoy the market without seeing every stall and store, though, so it can be worth it to enjoy the atmosphere from the outer perimeter.